Author box, is it really necessary for your blog? Author section in your article/blog matters. Author box makes an impact on the audience and readership. Once you write a splendid blog, audience craves to know more. That small author box somewhere in your blog enhances your credibility. Though many people love our content, no everybody would love to trust a stranger so an author box gives a real person’s identity and make it trustworthy. Not only this, having an author bio in articles/blog is an awesome payback for your dedicated authors or writer. This increase the collaboration possibilities and help in personal branding. Therefore, Author box is must have sections of your website. How to add an author box on your blog page? Simple, use the magnificent plugin available. There are many WordPress plugins available for adding author box in your website. 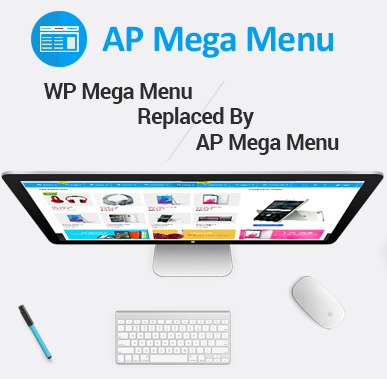 Fancier Author Box, WP About Author, Simple Author Box, Startbox, Ultimate author box are some of the most preferred Author box plugins for WordPress websites. So here I am going to give you the detailed insight of the latest and the most feature-rich premium WordPress Author Box Plugin – Ultimate Author Box. Ultimate Author Box is a powerful WordPress plugin for showcasing your author bio in your website. 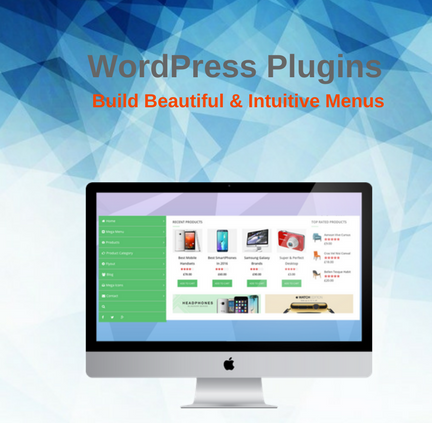 Elegantly designed, the plugin is optimized to look great on all devices. It is the awesome way to represent your post authors and a great payback for their great effort. It is an easy-to-use plugin with an intuitive interface. Just install the plugin and few more steps and you are all set to go! 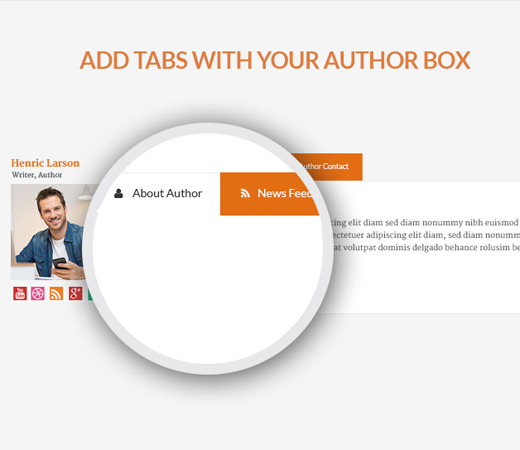 It is a shortcode ready plugin, just copy and paste the shortcode wherever you want to showcase your author box. Also, you can showcase your post authors using the Author Box Widget. 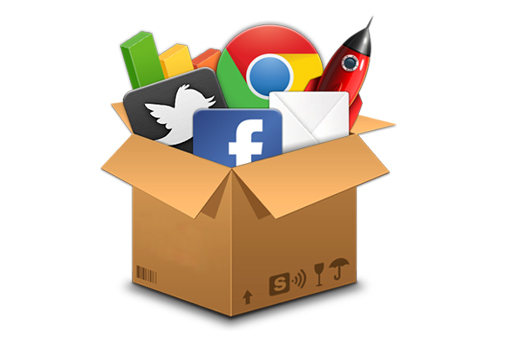 The plugin allows you to add tabs to your author box that includes author’s posts, social feeds, shortcode, widgets and much more. Ultimate Author Box is a fully responsive and SEO friendly article/post author section plugin for WordPress. What are the features on Ultimate Author Box? What sort of author box you want in your WordPress website? Simple one with author image, short description or a bit stylish with link to social profiles or the one with all detailed information about your authors. Yes, this is all possible with Ultimate Author Box. Besides, it comes with 19 different beautifully designed templates. You can present your author bio as per your wish. Display your great authors in style. 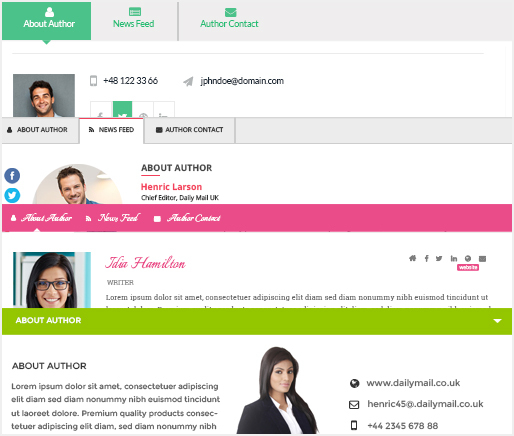 With this plugin you can not only display your author bio, it allows you to additional tabs to give detailed information about your authors and represent them in the awesome way. Tabs include author posts, in built contact forms or other forms, company description tab, social media feeds (Twitter feeds, Facebook feeds, RSS feeds) and custom tabs (Widget support in tabs, WYSIWYG tabs, shortcode support in tabs). You can add tabs as per your requirement and give as much as information you want about your authors. The plugin gives you full access to control the author box per post. Means, you can choose whether you want to showcase author box in certain post or not. Besides, it also gives the option to select the location of author box in each post. You can showcase author box at the top of the post or at middle or bottom – choice is all yours. Let the reader know your authors more through your social profile. To let your reader connect with your authors, the plugin includes 20+ major social icons. You can link your author’s social profiles (facebook, twitter, instagram, pinterest, stumble and so on) in the author box with social icons. It makes your author section look more interesting and attracting. Ultimate Author Box comes with a clean popup integration. On clicking the author image, you can show a popup with a clear summary about the author. 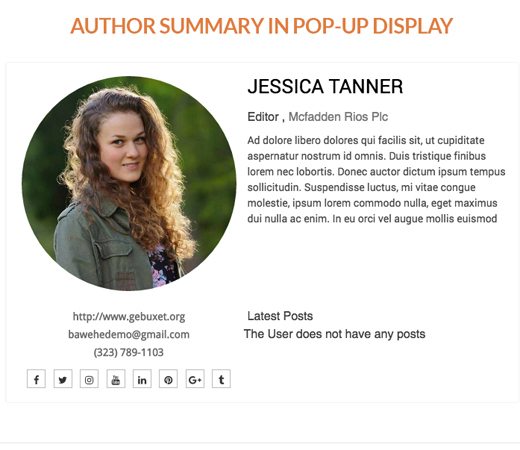 In popup you can include author details, contact info and recent posts. This makes your author section more interactive and informative. You don’t like the color of our pre-defined templates? Then, change it. You will an easy option to change the color of any template. 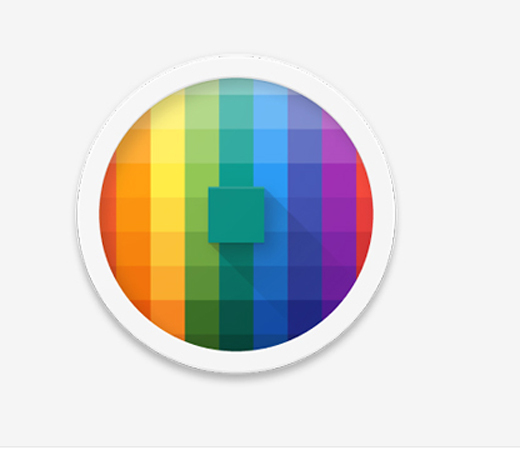 Choose the color of your choice from the unlimited color scheme. Customize your author box to better suit your website. You can display your author profile image from their social media like Facebook, Twitter and Instagram. Just copy the image location and paste. It’s done. 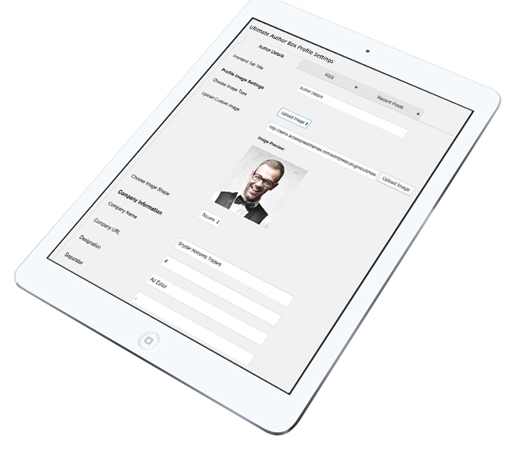 Or you can also set the custom image as your author profile image. 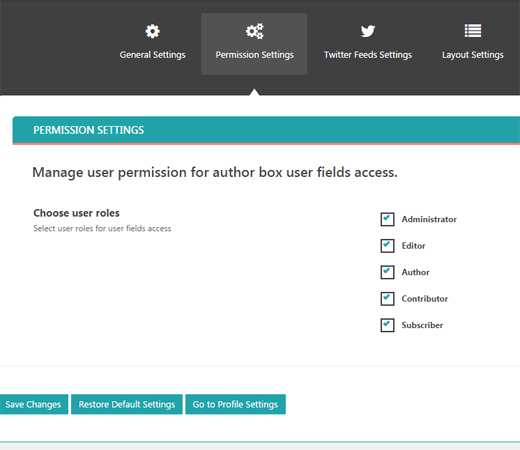 You have the option to manage user permission for author box user fields access. Only the selected users can access to author box. So select the ones whom you want to access in this field , so that your author box is safe and secure in the right hands. 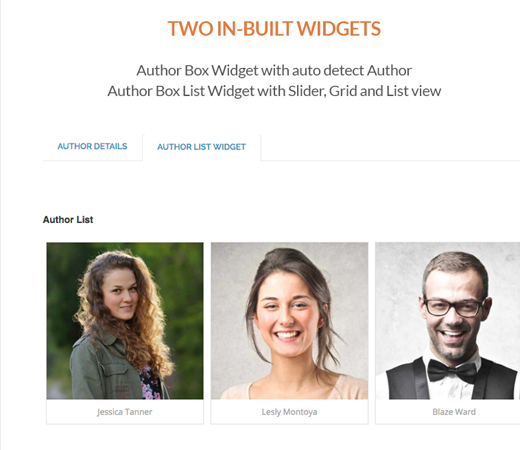 Ultimate Author box comes with two in-built widgets. One widget with auto detect author and the next with slider, grid and list. How you want to showcase your authors is all your choice. How to get Ultimate Author Box? All the premium themes by Access-Keys is featured in CodeCanyon. You can simply visit CodeCanyon and search for Ultimate Author Box or visit our site. For getting the plugin we need to go through few easy procedures. Once you complete it, you will get the zip file of the plugin. Once you get the zip file of the plugin. Go to your WordPress dashboard. Click on Plugins>>Add New. Then, click on Upload Plugin. Go to choose file and select the zip file you get and hit the Install Now button. After the installation is done, the plugin appears on the left admin panel. And you are all ready to go. For customizing the plugin, click on Ultimate Author Box in your left admin panel. It leads you to General Settings and start configuring as per your wish. Ultimate Author Box is worth the cost. It’s the must have plugins for magazine, newspaper and blog sites. Lots of amazing features and customization options with intuitive interface.It comes with easy configuration options – no coding skills needed. If you have any query related to plugin – please comment below. You are happy to reply you.